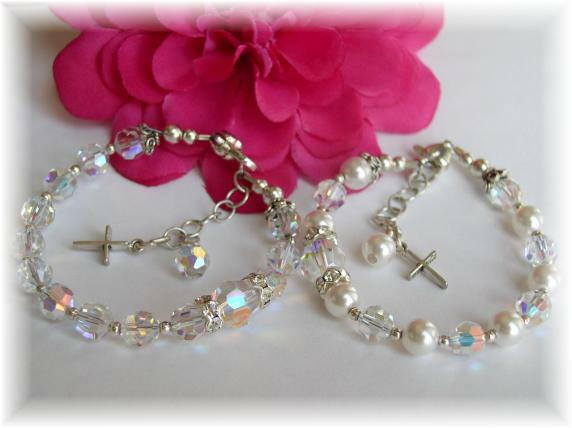 Beautiful Swarovski�crystal�or freshwater pearl rosary bracelet in your choice of colors. This beautiful bracelet is created with Swarovski pearls and crystals* or freshwater pearls, sterling silver accents and cross charm. This meaningful gift will be a cherished keepsake. Choice of colors. * Swarovski crystal bracelets not intended for use by children under 13. Please choose freshwater pearls for children 12 and younger. 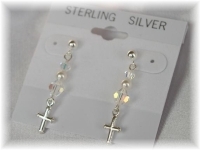 Child's bracelet will have a Swarovski "Our Father/Glory Be" and dangle "Our Father" bead which amount to less than 1 gram per CPSIA law.